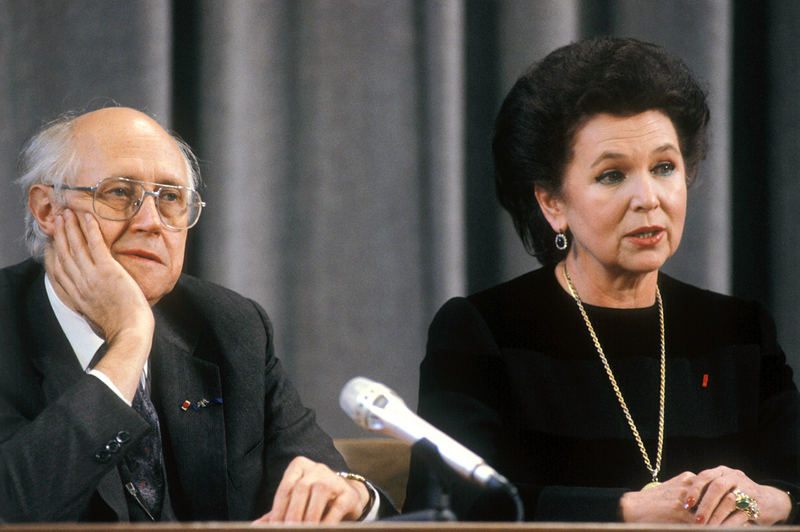 Mstislav Rostropovich, renowned cellist and U.S. National Symphony Orchestra Conductor Laureate, and operatic star Galina Vishnevskaya, his wife, addressing a news conference at the U.S.S.R. Foreign Ministry press center, 1990. On Oct. 25 Galina Vishnevskaya, legendary Russian opera singer and wife and muse of the great Mstislav Rostropovich, would have turned 90. In honor of Vishnevskaya’s anniversary, RBTH has selected 9 facts about her amazing life. The name Galina Vishnevskaya itself is resonant and theatrical. She kept her first husband's surname after the marriage, which lasted through WWII and proved to be short and unhappy. At birth the future star had a banal Russian surname – Ivanova. The singer spent her youth during the Nazi siege of Leningrad between 1941 and 1944. During the siege she lived in Kronstadt, an island city just outside of Leningrad. Later, when she was old, she would recall the daily 150-gram bread ration and the winter streets on which corpses would lie for weeks. In the evenings she would sing at the officers' house for the seamen defending the city. Vishnevskaya would often recall that singing had been her passion since she was a schoolgirl. In school she was called “Galka the performer.” “In first grade I received my first singing prize: three meters of calico, white with polka dots, and my grandmother used it to sew me a dress with flounces… I would sing everywhere: on the street, at school, at get-togethers, at home,” she once said. Her brilliant career began… in an operetta theater. Vishnevskaya did not attend a conservatory. In 1943 she moved from Kronstadt to Leningrad, where for several years she took private lessons from an old voice teacher, Vera Garina. Simultaneously she got a job as a light designer in an operetta theater. Then she was accepted to the choir and then she became a soloist. It was 1944, the war was still going on and the theater would perform for the military units and the collective farms in the Leningrad Region, which had just been liberated from the Nazis. "We'd sleep side by side, wherever we could… Each day we would perform in frozen clubs – on the walls there was snow,” she recalled. Vishnevskaya came to the Bolshoi by chance. In 1951, on a street in Leningrad, she saw an announcement inviting young singers to audition for the Bolshoi Theater's apprentice group. She not only made it to the second round in Moscow, but she left the judges speechless. She was the only one to be accepted into the Bolshoi troupe and several months later she performed the role of Tatyana in the famous opera Eugene Onegin. Her repertoire at the Bolshoi was vast and heterogeneous. It included Leonora from Fidelio and Katarina from The Taming of the Strew, Cherubino from The Marriage of Figaro and Cio-Cio-san from Madame Butterfly, and Verdi's Aida and Marguerite from Faust. Among her best roles were Violetta from La Traviata, Tosca, and Natasha Rostova from War and Peace. During the years of the Iron Curtain, Vishnevskaya was one of the few for whom the curtain was raised. She performed on the best stages of the world not only with the Bolshoi but also autonomously, as a guest performer. Her 1964 La Scala debut as Liù in Puccini's Turandot, opposite Birgit Nilsson and Franco Corelli, caused a sensation. In 1955 Vishnevskaya married cellist Mstislav Rostropovich. This was not only a wonderful event in their personal lives, but together the professional duet managed to conquer entire countries and continents. Thanks to her husband she entered the circle of the greatest musicians and composers of the age, such as Britten and Shostakovich, who would write especially for her voice. Rostropovich would conduct and his interpretation of Eugene Onegin would go on to enter the Hall of Fame of Russian music. Poet Anna Akhmatova, who in 1961 heard Vishnevskaya in Villa-Lobos' Bachianas Brasileiras on the radio, dedicated the poem Listening to a Voice to her. French composer Marcel Landowski dedicated his opera Galina to Vishnevskaya. Based on Vishnevskaya's memoirs, its premiere took place in 1996 at the Lyon Opera. Vishnevskaya and Rostropovich's exile from the USSR was the result of their friendship with Nobel Prize for Literature winner Alexander Solzhenitsyn, who wrote about the repressive system of Soviet concentration camps and was considered anti-Soviet. The pair had given shelter to the disgraced prose writer at their dacha, where he lived until leaving the USSR in 1974. One of Vishnevskaya's most remarkable roles was Katerina Ismailova in Shostakovich's eponymous opera. She also performed it in the “film-opera” of the same name. In 2006 Vishnevskaya played the leading role in Alexander Sokurov's film Alexandra, in which the screenplay was written especially for her. After bidding farewell to the opera stage, Vishnevskaya received many invitations from drama theaters. In 2002 she played the role of Empress Catherine II (the Great) in Behind the Mirror at the Chekhov Moscow Artistic Theater. The singer finally parted with the stage in 1983, after singing Tatyana from Eugene Onegin at the Paris Opera and received the Legion d’honneur. During perestroika she and Rostropovich were given back their Soviet citizenship and they moved to Moscow, although they also remained Swiss citizens. In 2002 Vishnevskaya established her own Center for Opera Singing for young soloists in Moscow. It continues to operate today.